Time for another game. 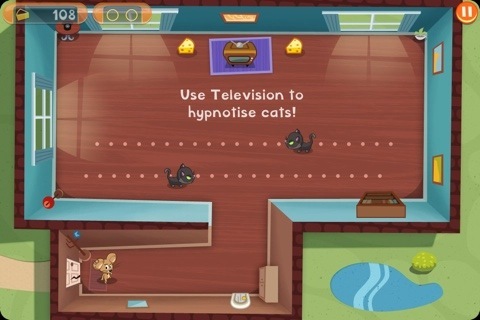 Spy Mouse is one of the more polished games I've seen on the iPhone. It's made by EA so you do expect a lot from them, and they do deliver. From the first moment you launch Spy Mouse you see that a lot of effort has gone in to creating this game. The opening animation sequence, including its music, is really good. But put all the sleekness and polish aside, what makes a game at the end of the day, is whether the actual gameplay is fun. And Spymouse delivers there too. 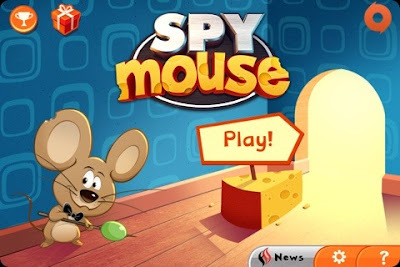 In Spy Mouse you are a mouse (surprising, ah?) who needs to collect his cheese. You need to sneak around and grab the cheese without letting the cats see you. If you are spotted, you better run, you may just be able to run them into walls so you can hide. Once you have collected all the cheese in a room head for the exit and you're done (assuming the cats don't catch you on your way out). There are lots of different elements and techniques that you encounter as you proceed and can use to trick those damn cats. Things like mouse holes that you can both hide in and use to move to different parts of the level, trying to lure cats in one direction while you run around and dash behind their backs before they notice, and other gadgets are all part of your bag of tricks. 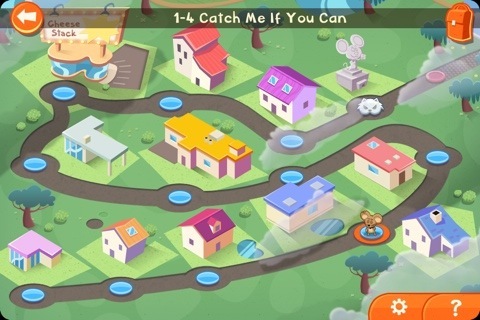 All in all, a very fun puzzle game that is really top-notch. And it's a great deal at only $0.99.